The Random Sampler a great tool for anyone who must create random samples. It can be used to select a random sample from a list of employees,invoices, accounts, orders, or anything. It is menu driven and easy to use. 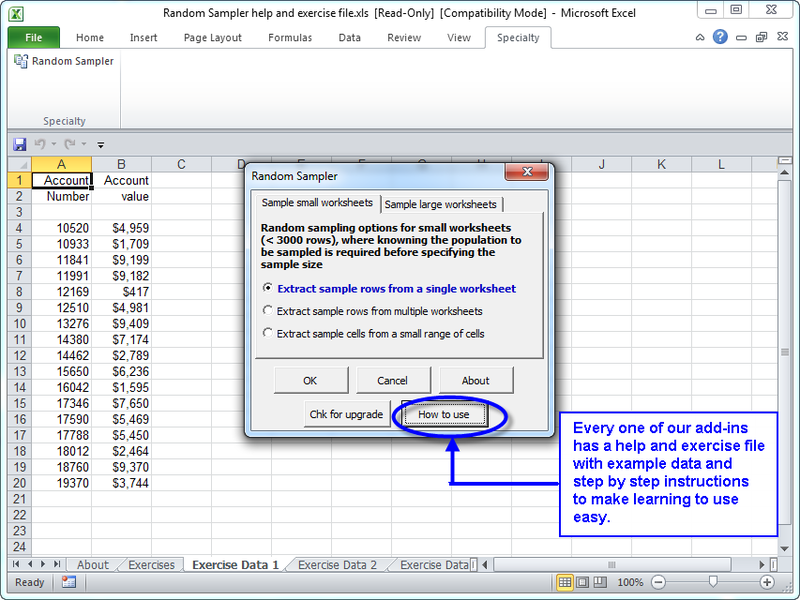 You just select your list in the Excel worksheet and tell it how many samples to extract. You can exclude from the samples rows that have already been sampled. Or you can exclude from sampling if there is an entry in a particular columnl or if the row is colored. This makes it very easy to create a new sample list and not include previously sampled data. One can specify the seed for the random sampling. By specifying a seed value, one can share the seed value with another (such as an independent auditor), who can duplicate the identical sample from the data using his/her copy of the Random Sampler.